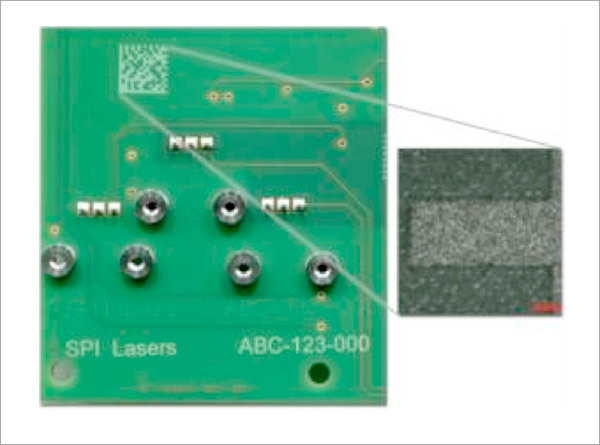 The use of Laser marking of PCB boards is a growing application. Traditionally basic alpha numeric information has been used but there is a move to bar codes and ID matrix marks to provide more data. A high contrast white mark can be made using short pulses at high repetition rates using the capabilities offered by our redENERGY G4 HS functionality. Too much pulse energy leads to burning of the substrate. Using high scanning speeds and 50microm line spacing, high quality machine readable ID matrix marks can be made. A marking technique using 2 passes with the marks made at different hatch angles offers the best result. 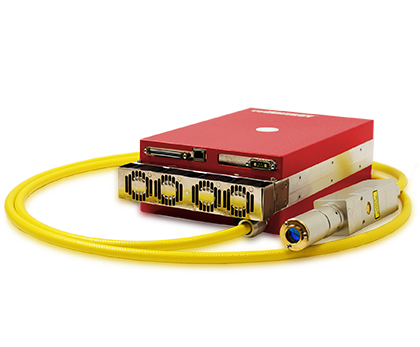 If required, the same Laser could be used for drilling holes, or even cutting through copper tracks. The 6x6mm ID matrix was marked in <1s and the micro graph shows the edge quality of the mark.